SO happy with my stay here. 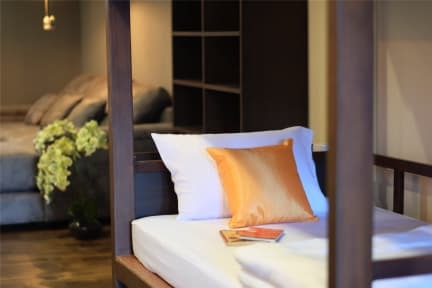 The location is fantastic, a short walk away from the metro and many good local restaurants, friendliest staff, most delicious breakfast and cleanest rooms/facilities. Can't rate this place more highly, just stay here. Really close to MRT few minutes walk. The property is cozy decoration. Super nice owner big and comfy bed. Shopping mall, mini mart, street night market restaurants/food are walking distance. Highly recommended. The owner, his family and staff members are all great people. Everything is clean and in working condition. Breakfast every morning was pleasant. The area is quiet and within walking distance to BTS, food and shopping areas. I have no complaints and will stay here again next time I go to Bangkok. If you have to stay around this location, choose it. 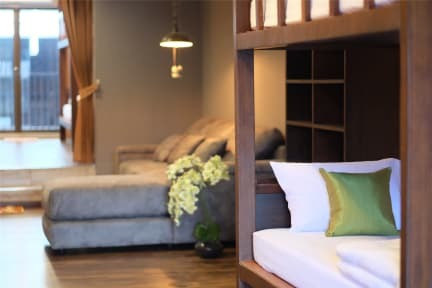 It also close to a subway station conveniently connecting you to the rest of Bangkok. I found the facilities are good, which is average in Bangkok but better than many other countries' average. Many free fruits. No complaint.